In conjunction with the Undying Hope for this Dangerous World exhibition, celebrating the 50th anniversary of the Bertrand Russell archives at McMaster University, the Museum of Art invited Nova Scotia College of Art and Design University professor Bruce Barber to develop an artist project. Barber’s project launches at the Museum in September with a special event and an exhibition environment – complete with recreated version of Russell’s cell in Brixton Prison – highlighting the life, work, and continued relevance of the renowned British philosopher and mathematician. – Academics, Public intellectuals and Political Activism. Museum’s front desk are happy to provide elevator access. Russell spent six months in Brixton Prison in 1918 for prejudicing “His Majesty’s relationship with the U.S.A” and where he wrote his Introduction to Mathematical Philosophy. 2018 coincidentally marks the centenary of the end of the First World War that will be probably reduced to jingoistic celebrations of militarism that would have been abhorred by the philosopher who spent much of his life protesting war. For the Museum, Barber has devised a reading room environment. 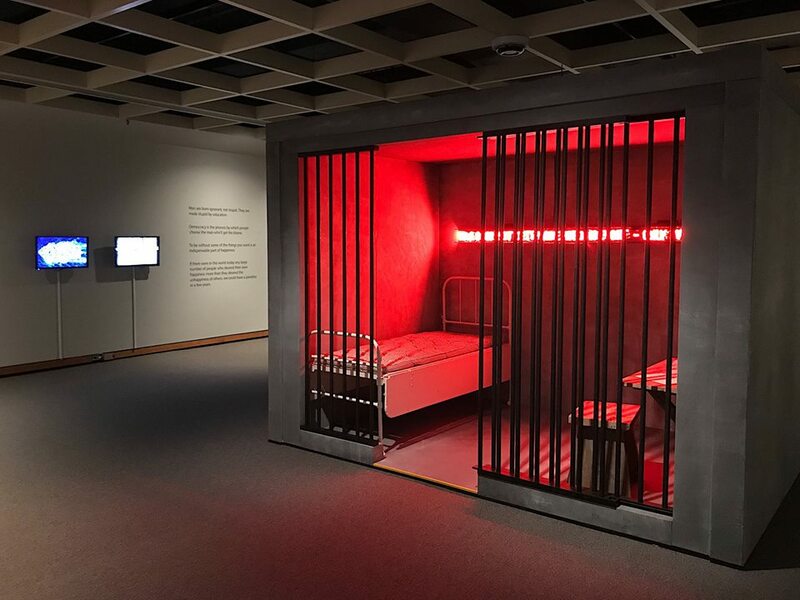 The key gallery element is a constructed simulacrum of the Brixton prison cell, furnished with a bed, writing desk, stool and a quote from Russell, realized in neon: “War does not determine who is right – only who is left.” Other Russell quotes will be positioned on the perimeter walls of the gallery space, with two Barber-produced videos relating to Russell, his life and times, and images of the present to raise awareness of Russell’s life and work and continuing relevance in today’s world; the complex ethical issues that surround forms of oppression, terrorism and “war responses” affecting the lives of people globally. Bruce Barber was born in New Zealand and has worked internationally across performance, installation, film, video and photography since the early 1970s. His artwork has been exhibited internationally at the Paris Biennale, Sydney Biennale, 49th Parallel Gallery NYC, the New Museum of Contemporary Art, NYC, Walter Phillips Gallery, London Regional Gallery, Auckland City Art Gallery, Artspace, Sydney, Auckland, London, Paris and Venice (2015, 2017), and is represented in various public and private collections. Barber is the editor of Essays on Performance and Cultural Politicization and of Conceptual Art: the NSCAD Connection 1967-1973. He is co-editor, with Serge Guilbaut & John O’Brian of Voices of Fire: Art Rage, Power and the State. Editor of Condé +Beveridge: Class Works (2008); also author of Performance [Performance] and Performers: Essays and Conversations (2 volumes) (2008); and Trans/Actions: Art, Film and Death (2008); Littoral Art & Communicative Action edited by Marc James Léger (2013). His critical essays have appeared internationally in numerous anthologies, art journals and magazines. Barber’s interdisciplinary art practice is also documented in the publications Reading Rooms (1990) and Bruce Barber Work 1970-2008 (2009).